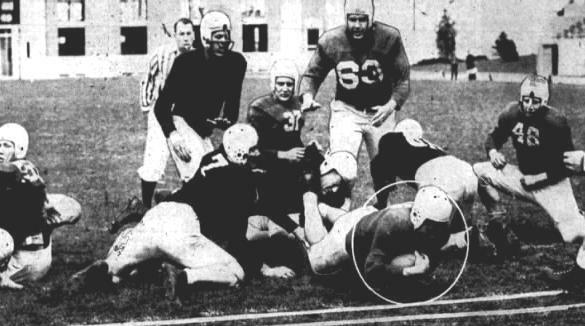 Dale Bradley scores for "Army" in 1942. Our year-by-year rundown starts with the 1940s. The ’30s and ’20s will be covered in the coming days. All games were played at Memorial Stadium unless noted otherwise. 1943: Spring drills dwindled to 10 or fewer players as football took a back seat to the war. Coaches were pulling double duty as P.E. instructors for the military. Practices consisted of touch football and conditioning. Due to the player shortage, an intra-squad game was out of the question, and a proposed spring game against Missouri didn’t pan out. 1944: Wartime realities continued to take their toll as fewer than 20 players reported for the first day of spring drills on April 5. Practices included no scrimmaging and were finished by the end of the month, though voluntary workouts continued for another two weeks. 1945: Twenty players reported on April 9 for the start of spring drills, which were “informal practice sessions” that would run through the first week of May.